#uLead15 was an opportunity for educators to hear from some of the leaders in education where PISA scores are consistently the highest. It was obvious that the leading PISA countries do not use strategies like practicing test writing, teaching to the test, focusing on “moving the high level two students to level three”, data walls, SMART goals, common core standards or tying teacher pay to student “achievement”. In fact, the words “student achievement” are rarely used in relation to test performance. Overall, there is an agreement that valuing education as a society, having very high-performing and highly-respected teachers who learn to teach in a highly selective, focused program of education, and viewing education as an investment rather than an expenditure, are critical characteristics of the people living in the countries where PISA results are consistently excellent. Personally, it was my first opportunity to learn about education in Singapore. 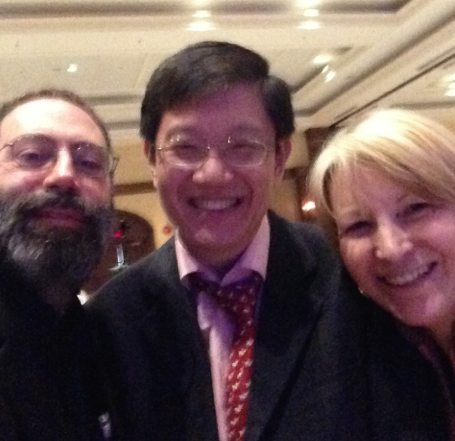 Here is what I learned from the fascinating, highly entertaining and widely respected Dr. Pak Tee Ng. What are the characteristics of education in “high-performing” Singapore? 1. Manageable size – Adaption/adoption and spread are facilitated by the small size of the country. 2. Stable education funding – Education is an investment and funding is never cut. 3. Highly skilled and educated teachers who are well-respected in the nation. 4. Education is valued by all as the way to a better future. 5. Equity is at the centre of the education system. Everyone has access to the same public education system. 6. 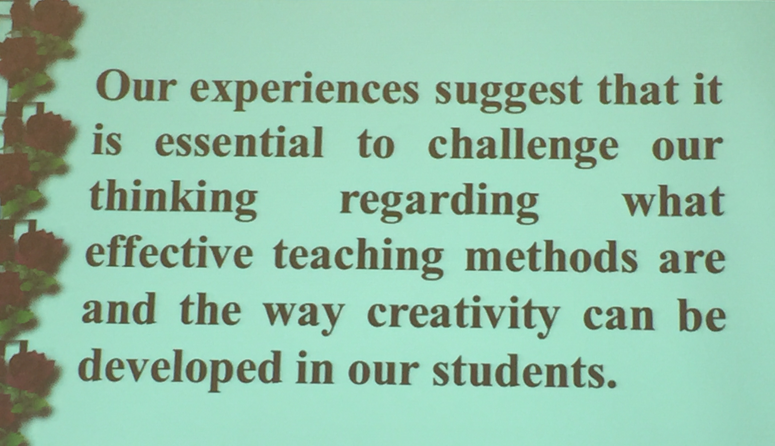 Teaching is seen as complex, and inquiry, including adapting methods from other contexts, is ongoing, always. Change from a position of strength is preferable to, and more mindful than, change made out of desperation. 7. Courage and tenacity to stand up for what is best for children is valued and encouraged. 8. 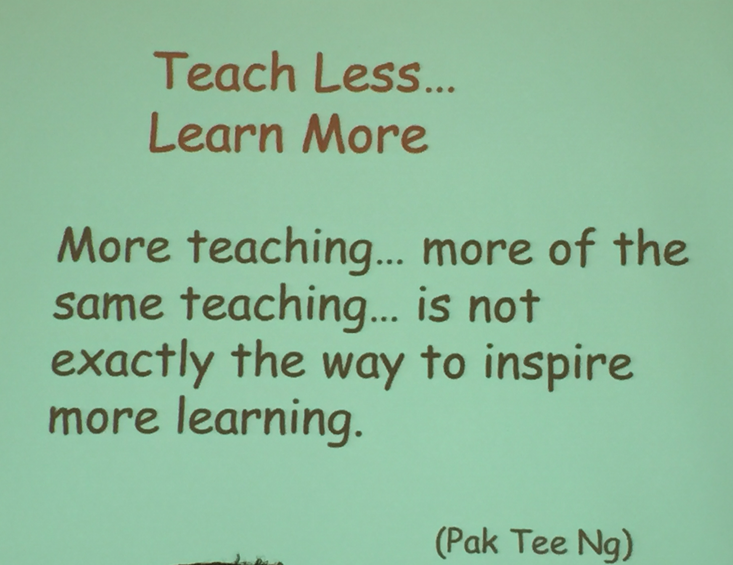 “Teach less, learn more” is a central concept. 9. Creativity is in children already. Schools should strive to leave it there! 10. Children are individuals. They were not meant to sit in desks all day. Play, joy and love of learning are essential to their well-being. Singapore itself is a very tiny country. There are only 400 schools and one university for teacher education. This reminds me of the work by Ken Leithwood on the characteristics of strong districts, and the learning from Andy Hargreaves on the importance of the size of the political unit when considering the impact on student learning. Pak Tee Ng is a master at the use of metaphors. He asked us to consider the loving mother, cooking food for her child, slaving over the stove and selecting the items she knows are best for her child. When she tries to feed the child, he says no, I am not eating any more. Then what? She tries to stuff the child. She makes more food. The child wants no more. 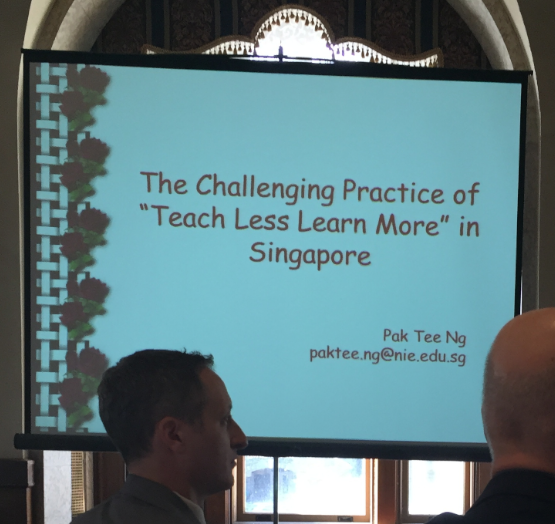 This, Pak Tee says, is the ‘teach more learn less’ model, where conscientious and well meaning teachers work hard, trying to organize information for students, then they try to stuff it into their heads. The students hate it and want no more. Instead, what if the mother cooked a few wonderfully interesting food items. Students tried them and wanted more? This is like the ‘teach less learn more’ model, where the teacher is the master chef, creating interest, and leaving the learners wanting to learn more, and to learn how to feed themselves to get more. 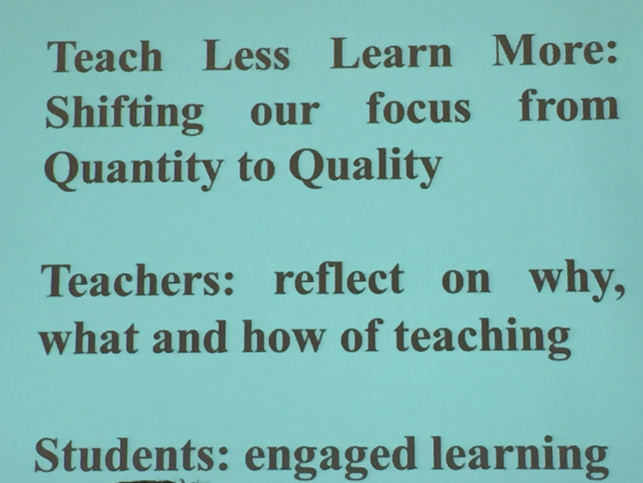 It’s precise teaching – inquiry into what works – that is important. When you go to the doctor, does he say “take two aspirins and call me in the morning” no matter what your symptoms are? Similarly, why would we ever prescribe exactly the same learning for every child? Continuing to do the same thing that we know doesn’t work, makes no sense. We work very hard to educate our teachers and education leaders to be the best they can be for every child. It is NOT about test scores. It is about children, and our future. Why do we think we need 21C Skills? What has changed? Isn’t it still about the best learning for children? We don’t need to teach creativity. We say we want our children to graduate from school as creative and innovative individuals. Our children enter school this way. We just need a school system that doesn’t take this out of them! We need to recognize that both form and substance are important. Practice is important, but it is no good to only practice. There must be joy in learning. We have to remember that we are teaching children. It is against the nature of childhood to sit still and quiet. Do we really want to create a student body that is just becoming more tolerant of boredom? Every single child must be educated to the best of their ability. We don’t need a slogan like “No Child Left Behind” because it would never be any other way. There is no magic bullet – education is complex! Teachers are the most important people in society. Educators need courage and tenacity to stand up for what is best for our kids. Courage to make the right decisions must be balanced with wisdom so that we are always doing the best for our future through our children. Education is an investment, not an expenditure. We have long term stability in education funding so we can plan and continue to make our education system excellent. We must get Pak Tee Ng on Twitter! There is so much to learn from him! Here we are trying to convince this man, trending 2nd in Canada on Twitter, that he needs to be there!